You'll be £4.99 closer to your next £10.00 credit when you purchase Digging the Trenches. What's this? Modern research methods – archaeological, historical, forensic – have transformed our view of the past. This is especially true of the history of the Great War. In this, the first comprehensive survey of this exciting new field, Andrew Robertshaw and David Kenyon introduce the reader to the techniques that are employed and record, in vivid detail, many of the remarkable projects that have been undertaken. They show how archaeology can be used to reveal the position of trenches, dugouts and other battlefield features and to rediscover what life on the Western Front was really like. And they show how individual soldiers are themselves part of the story, for forensic investigation of the war dead is now so highly developed that individuals can be identified and their fate discovered. As featured on BBC Radio Surrey, Dorking Advertiser and the 'Get Reading' website. What holds true for uncovering the ancient past through archaeology also holds true for the not so ancient past. 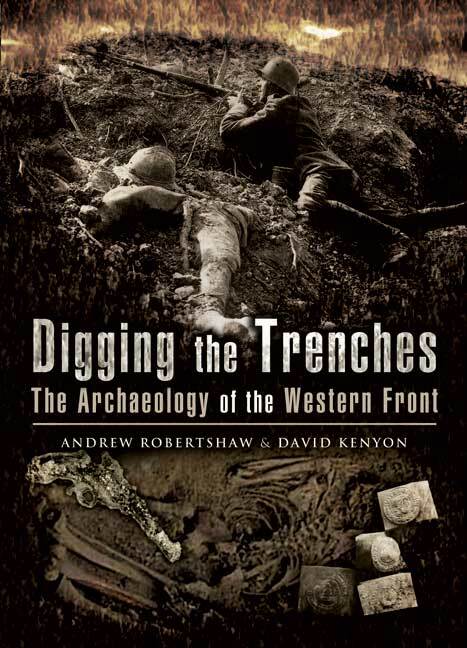 This book is an outstanding introduction to the field archaeology of the Western Front trenches of the First World War. It is full of period and modern photographs (some in color) of the men, materials and the life they left behind one hundred years ago under the most abominable of conditions. The reader gets a somewhat large dose of the workings of archaeology, in some cases necessary for a fuller understanding of the reconstructed past. As seen in Essence Magazine. The book is well laid out and easily digestible. It’s clear and factual and has a great collection of both colour and black and white photographs. ... I’ll never walk the fields of the Western Front again without thinking of all those souls lying beneath waiting to be discovered. As seen in Malmesbury Connections. This is an interesting and well-illustrated look into the exciting world of modern archaeology. It is a book not to be missed and it should appeal to a wide audience as a modern detective story. It may enthuse some readers to such an extent that they will become archaeologists and contribute to our essential pool of knowledge of the past. I could not put this book down. Presenting an entirely different approach to other First World War titles, the authors detail a number of projects in which they have been responsible for advancing the historical understanding of the Great War. Perhaps the most enlightening part of the book are the case studies. After all, identifying those who were killed and allowing proper commemoration is perhaps why battlefield archaeology is so important. This is a terrific book that not only gives insight into the motivations and ways of the battlefield archaeologist but provides a great deal of information about the war, the battles and the soldiers and their equipment….The material is presented clearly and at a good pace, peppered with some very good photographs. Clear typography is supported by well chosen illustrations, many in colour. Digging the Trenches is a genuine pleasure….a well presented and written work, worthy of very considerable praise. The book is an excellent introduction to the subject, covering how archaeology is carried out, what it can tell us about the conditions in the front, and ending with poignant tales of four men whose remains were uncovered in the course of archaeological digs….Digging the Trenches is essential reading and unlikely to be displaced as the best single accessible book on the archaeology of the Western Front for years to come. Dr David Kenyon has had a lifelong interest in military history. A keen horseman himself, he has dedicated many years to the study of mounted combat in the nineteenth and twentieth centuries, and in the Great War in particular. He is also one of the most experienced Great War archaeologists in the UK and has worked all over Britain as well as in Europe and the Near East. He was the lead archaeologist on the television project Finding the Fallen, and he has contributed to Great War programmes for the BBC and other broadcasters. He is the archaeological director of the Thiepval Wood Great War archaeology project in France, and a consultant to the Seddulbahir Fortress project in Gallipoli. Editor - Andrew Robertshaw is Curator/Manager of The Royal Logistic Corps Museum in Deepcut, Surrey. For the past fifteen years he has been organizer of a variety of battlefield archaeological projects on the Western Front. He frequently appears on television as a commentator on battlefield archaeology and the soldier in history. His publications include A Soldier’s Life, The Somme 1st July 1916, Digging the Trenches (with David Kenyon) and Ghosts of the Somme (with Alastair Fraser and Steve Roberts).